Posh boss Steve Evans gets a vist from the referee during last season's game at Plymouth. Plymouth boss Derek Adams looks on. Peterborough United can turn a great start to the season into a record-breaking one with a win at Plymouth on Saturday (August 25). Posh have never won their first five Football League matches of the season, but they moved onto four straight wins after Tuesday’s success at Charlton. Britt Assombalonga helped Posh to a great start in the 2013-14 League One season. That record is enough to give Posh top spot. Only they and League One rivals Portsmouth can boast 100% winning records in the entire Football League. The bookmakers have reacted to a blistering start by trimming Posh odds to win League One from 16/1 to 9/1. Steve Evans’ men are just 5/2 to win promotion. “It’s too early to make bold predictions,” manager Evans said. “Teams will improve and others will fall away as form comes and goes throughout the season. “We must make sure we stay the course. We’ve been good so far. We’ve played well at times and we’ve battled hard like we did at Charlton. “We haven’t always played smartly, but we’ve always worked hard. We want to make sure we are the hardest working team in the division. Evans returned home from Charlton after midnight and was watching a dvd of Plymouth’s draw with Wycombe from that night seven hours later. He was impressed with what he saw. “Plymouth should have been out of sight at half-time,” Evans stated. “They scored once and should have scored a couple more. “They have good players like Graham Carey and Ruben Lameiras and we won’t be taking any notice of their slow start as they did the same last year and then almost reached the play-offs. “Plymouth are a well-managed club. Me and their manager Derek Adams go at it during games, but we’re friendly enough off the pitch. Posh have no injury concerns for the trip to Home Park so Evans could well name the same starting line-up for the fifth straight match. Evans is still chasing an extra striker and a centre-back in the loan transfer market, but don’t expect to sign anyone before the game at Plymouth. The deadline for loan transfers is August 31. Posh have now won their first four Football League matches for the fourth time in the club’s history, but they’ve never made it five in a row. Posh beat Plymouth (2-1), Bristol Rovers (4-1), Rotherham (2-1) and Northampton (4-1) to start last season, but drew game number five 0-0 at Doncaster. 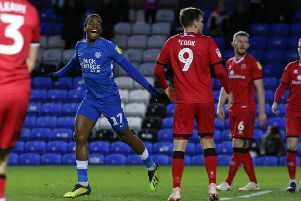 In the 2013-14 season Britt Assombalonga-inspired Posh beat Swindon (1-0), Notts County (4-2), Oldham (2-1) and Tranmere (5-0) before losing next time out 2-0 at home to Crawley. And in the 1961-62 season Posh beat Hull (3-2), Watford (3-2), Port Vale (1-0) and Watford (4-3) before losing 4-3 to Bristol City at London Road. All three runs took place in the third tier and none led to promotion.